Do you ever miss snacks from your childhood? Here's a fun list mainly geared at for Generation Yers (like myself), but I think older and younger readers might get a kick out of it, too. Collegecrunch.org compiled a 20 Discontinued Snacks We Wish Would Come Back list, complete with classic commercials. Personally, I'm pretty happy with the current snack selection, but there are a few things I miss. On the Collegecrunch list, I fondly remember the palate-slicing French Toast Crunch cereal and, of course, that a classy little party beverage called Ecto Cooler. Off the list, I've already mentioned the brief American appearance of Koala Yummies, and every now and then, I get a craving for Teenage Mutant Ninja Turtle Pies. How about you? This cute yet slightly creepy package of gummies called out to me, although I can't remember where. It wasn't a gift...maybe I bought it in Vancouver, BC this October? 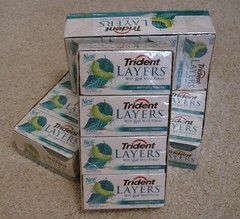 I mention this because I'm normally very good about remembering where I buy my snacks, but these, I'm just not sure. The company Kasugai makes many gummy candies, including a well known, Engrish-laden line called Gummy 100 that is made with 100% fruit juice. 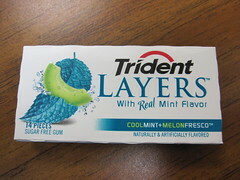 They are well-worth trying, since they taste just like real fruit. I especially love the red and green grape flavors, but that's for another review. 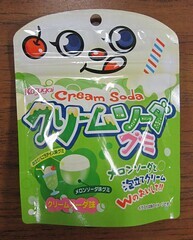 In Japan, cream soda almost always means melon cream soda, which is why this package is predominantly green. 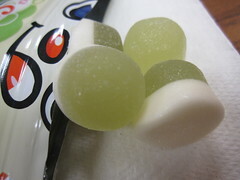 The gummies themselves are green and white, with the white half simulating a scoop of vanilla ice cream. It might be called a Melon Soda Float in the US (if we had melon soda). The gummies smelled like slightly floral melon and citrus in the open bag. 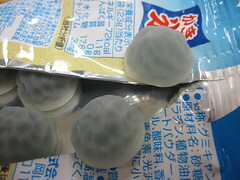 There was an odd coating to the gummies that made them feel slippery, and it immediately put a powdery film on my teeth. It went away quickly, but it was weird and detracted a bit from the otherwise very tasty flavor. 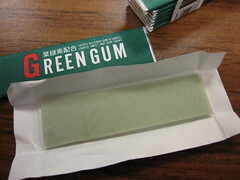 The green part was a mildly sour, almost melon gummy with hints of lime, and the bottom layer tasted and chewed like marshmallow for a neat texture play. Actually, the weird waxy film reminded me of eating straight marshmallows (something I haven't done since I was 8 because I don't like them). Still, the flavors melded together so nicely, and these went over well when I shared with friends. 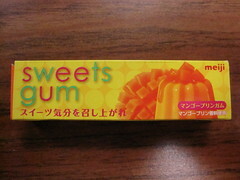 No one mentioned the filminess, but they raved about the flavor, so I'd still recommend these gummies. A few weeks ago, I house-sat for my parents when they were out of town. 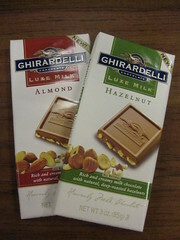 My parents know me pretty well, because they "paid" me in chocolate! Their two cats are so cute that I would do it for free, but I wasn't about to turn those candy bars down. 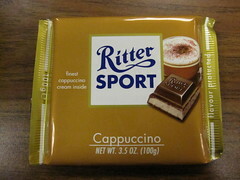 Part of my "payment" was this Ritter Sport Cappuccino bar. Although I've seen it many times in stores, I've never purchased it for myself or even tried it. I love drinking coffee, but I'm always a little wary of coffee flavored treats. Too many of them have the sour, bitter aftertaste of cold, old coffee and not enough of the bold, toasty richness of a fresh cup. 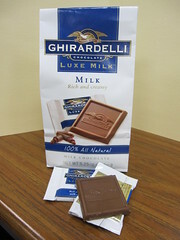 The chocolate had a mild coffee scent, and the milk chocolate coating was sweet and just a bit salty. 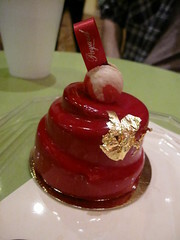 The filling was smooth and cool on the tongue, and it had a creamy coffee flavor. Thankfully, the coffee flavor wasn't too sour, and the sweetness of the chocolate balances the subtle bitterness from the cappuccino flavor. Overall, the bar was enjoyable and sweet without being cloying, and it was one of the better coffee flavored sweets I've tried. Hey, this makes two Kabaya reviews in a row! 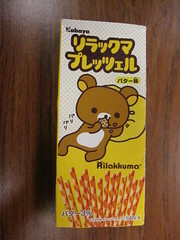 Instead of gummies, it's a Kabaya take on Glico Pretz, with a cute mascot character (Rilakkuma) tie-in. This snack was kindly provided by Tsunami.hk. Rilakkuma is basically a couch potato. His name comes from the English word relax and the Japanese word kuma, which means bear. He spends most of his time relaxing, presumably stuffing his face with cookies like on the package. The design on the inner bag was strikingly adorable. 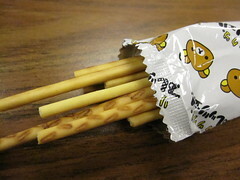 Although the package says pretzel, the sticks are more like crackers (basically naked Pocky). They smelled like buttered toast, and had a fresh, appetizing crunch. 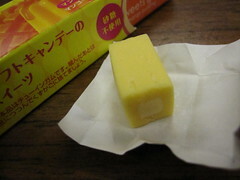 The flavor was slightly sweet, salty, and buttery without being oily. I didn't detect a preservative aftertaste, and had no trouble finishing the whole bag (160 calories) in one sitting. 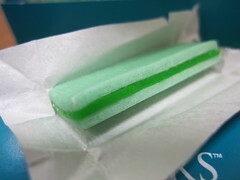 Although addictive, they were pretty basic as far as snacks go. Still, they definitely satisfied my craving for crunchy. In a world of endless Pocky-like snacks, Toppo is one of my favorites. I usually like it better than Pocky (with the exception of those fancy dessert mousse types of Pocky), so I was excited to try a new flavor. However, in a world of endless desserts, cheesecake is not my favorite. Oh sure, a bite is good, but it's often just too rich for me - even New York style (though it is better). It could have something to do with the lactose intolerance, but if I'm picking the dessert, it's almost certainly not going to be cheesecake. 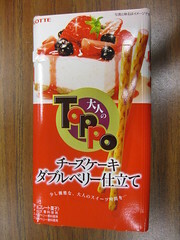 The Toppo smelled strongly of cheese (yep, I took a Lactaid) but not cheesecake. The cheese flavor was quite subtle and didn't seem like cheesecake at all. 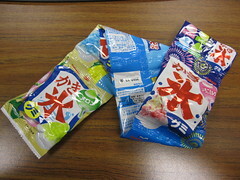 Mostly, I tasted the strawberry and blueberry flavors, but they had a slight soapiness about them. 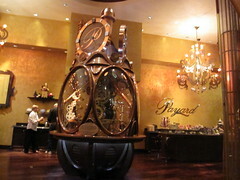 The pretzel was standard, slightly sweet and salty Toppo fare, with a slight preservative-like aftertaste. The whole thing left a little oily residue behind, but it wasn't bad. 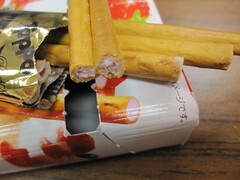 The soapy berry flavors turned me off, and I definitely prefer regular chocolate Toppo to this limited edition. 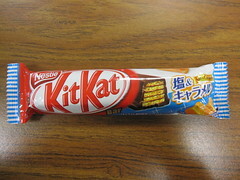 This flavor has been recycled many times since Nestle Japan started selling limited edition KitKats, but this might be the first time I've tried it. Salted caramels were quite trendy a few years ago, and even though the sweets industry has mostly moved on, the combination is still good. The packaging feels a little nautical, and I like that. 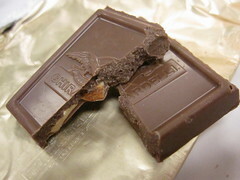 My bar was a little melted, since it came from Japan in the summer (and I'm just getting around to it, yikes), but it still had its structural integrity, so I doubt the flavor was affected. 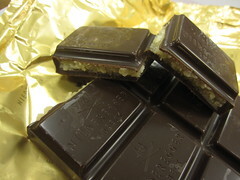 The chocolate had a strong caramel scent with just a hint of salt. 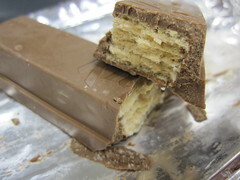 When I bit into it, it was apparent that the wafers were very salty and that the caramel flavor seemed to come from the chocolate. The two tastes came together nicely for a savory flavor. 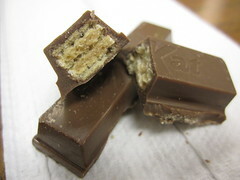 I do enjoy the ratio of wafer to chocolate in the larger KitKat, especially when the flavors are done well. 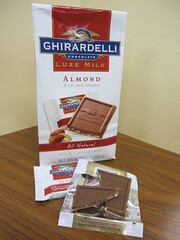 The salt mostly kept the sweetness of the milk chocolate in check, and the bar easily defeated my craving for salty/sweet. Since I don't live in Japan, Country Ma'am cookies are something to which I have very little exposure. 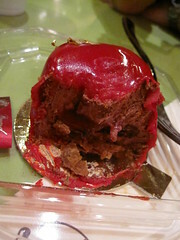 On my last visit to Kyoto, I tried a kinako version that was tasty, but I think that's the only time I've had them. 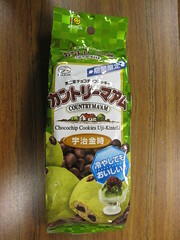 You can read several reviews of different types of Country Ma'am cookies at Japanese Snack Reviews. Ujikintoki is a type of Japanese shaved ice dessert (kakigori) made with matcha syrup and red bean toppings. The package suggested putting the cookies in the refrigerator to simulate the shaved ice dessert. To get the full effect, I tried three different preparation methods: straight out of the bag, one hour in the refrigerator, and 20 seconds in the microwave. Straight out of the bag, the cookie was grainy and very sweet, but it had a soft and chewy texture. The matcha and azuki flavors were subtle, and I also tasted brown sugar. 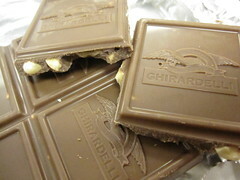 The chocolate chips seemed downplayed by the other flavors. Refrigeration brought out the chocolate and azuki flavors, but the matcha was almost undetectable. Also, the cold made the cookie a little crunchy and I prefer a softer chew. I'd definitely recommend going with the microwave option. The warm, buttery cookie had a nice chocolate and matcha scent, and they were so soft and gooey. 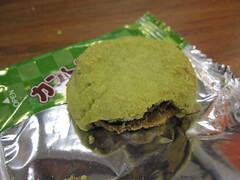 They tasted like brown sugar or molasses with less azuki flavor and a little more matcha. 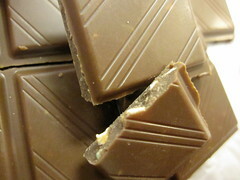 I'm pretty big on textures, so any chocolate bar with a new or interesting makeup is at least a good experience. 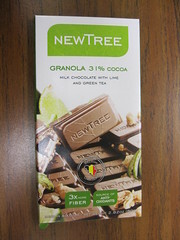 I'm not sure if this NewTree bar is state of the art in terms of components, but flax seed and cookie crumbs are not thing I often see in chocolate bars. My sister gave me this bar as part of my birthday present last month. 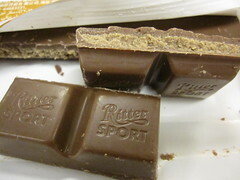 Many of my favorite chocolate bars involve cookies (like the Ritter Sport Butter Biscuit, KitKat Cookies+, or Tirol BIS), so this bar had the potential to be a winner, despite my limited experience with flax seed. 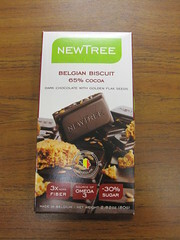 The Belgian Biscuit bar had a bitter, toasty scent and a good snap. 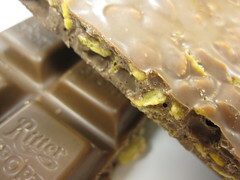 The cookie bits and flax seeds gave the bar a rich and almost spicy flavor without adding any heat. As for the texture, it was crackly and crunchy, and most certainly new to me. At 65%, the cocoa was just about perfect, and the chocolate was clean, smooth, a bit bitter but not fruity - a great match for the sweeter cookie bits. 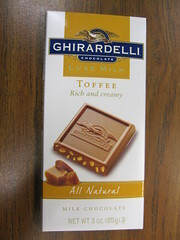 I've been try a lot of chocolate lately, but this is one of my new favorites! I don't know about the health benefits, but I'd definitely recommend giving this bar a taste! 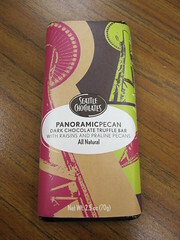 After the filling distribution issues with my last Seattle Chocolates bar, I was a little worried about this one, but at the very least, the chocolate would be good. Oranges and chocolate are a classic combination, and the idea of candied orange peel filling sounded very appealing. This bar was purchased locally, and again, the packaging really caught my eye. Clean lines and bright colors always seem to work on me. No Seattle tie-ins on the name of this bar, but at least there's a nice little pun. 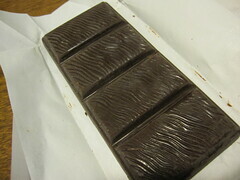 The orange zest aroma of this bar was amazing. 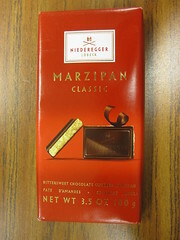 The chocolate was soft and delicious, and the slightly bitter cocoa was wonderful with the sharp, sour orange flavor. 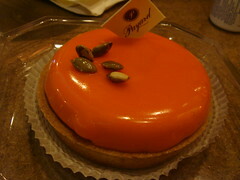 I don't know what I was expecting from the texture, but the candied orange peel was really hard! It almost felt like that unexpected bone in your meat, and it definitely took some getting used to. Even with the texture surprise, the flavor was unique and wonderful. 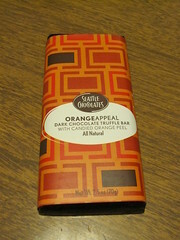 The orange peel was sour and zesty (and evenly distributed throughout the bar), and it was just perfect with 53% cocoa. 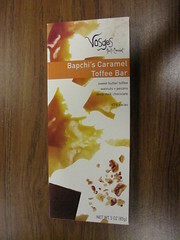 There was no aftertaste or sticky mouthfeel, and it was a good bar all around. Just watch out for that candied peel! This cute little bottle of Melon Soda flavored Ramune candy was included in the promotional package kindly provided by Tsunami.hk. 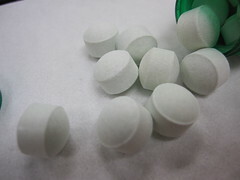 This type of candy is very similar to Smarties in the United States - flavored pressed sugar pellets. I don't know anyone who gets excited about Smarties, but I don't know anyone who hates them, either. I'll admit it - I've bought little Hello Kitty or Pokemon toys from grocery stores in Japan for myself and for souvenirs, and they often include a wrapped Ramune candy pellet. 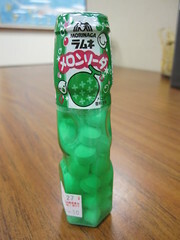 One is usually enough for me, but this Morinaga candy packs a whole 27 grams worth of pellets - 23 grams of which are sugar! The open bottle smelled sweet and reminded me of cotton candy. The pellets chew into a very fine powder with an intensely sweet and slightly sour citric acid flavor. I didn't get any hints of melon soda, and the aftertaste was a little chalky. They were very similar to American Smarties. Still, even though Morinaga didn't deliver on flavor, I can't say I disliked the taste. The whole bottle was too much for me to eat in one sitting, but I'm not really the target demographic. After 5 or 6 pieces, I had a nice sugar rush, but the candies became a bit cloying and I had to put the bottle away. Although I've seen Seattle Chocolates in my area, when I was visiting Seattle and saw this truffle bar in the Space Needle gift shop, I was compelled to buy it. 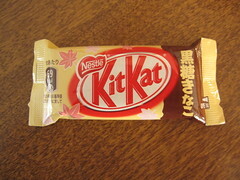 The package design was very cool, and I thought it would make a good souvenir...and I ended up eating it myself. To be fair, I shared it with 3 people, but I do feel a little guilty. 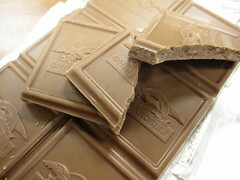 I never made the connection before, but many of the Seattle Chocolates truffle bars pay homage to famous locations in the Seattle area. 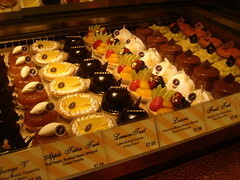 Some good examples are the Pike Place Espresso Bar and the Whidbey Wildberry Truffle Bar, but I haven't tried either. 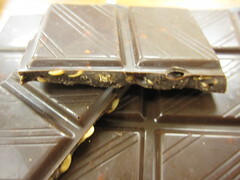 Panoramic Pecan promised raisins and praline pecans in dark chocolate truffle. 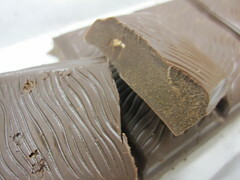 Because it's a truffle bar, the chocolate had a matte finish and a very soft snap. It smelled of raisins and chocolate (like Raisinettes, if you've had them). 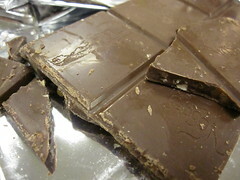 The chocolate was sweet for being dark, but it was very smooth and silky with a mildly bitter finish. I liked the texture and the flavor very well. Did you notice that I haven't mentioned any pecans or actual raisins yet? 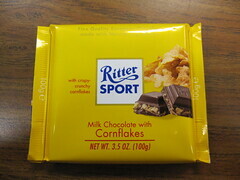 That's because in the first of 4 quarters of the bar, there was almost nothing but chocolate. My piece had one tiny candied pecan piece, and while it was crunchy and had a nice caramelized flavor, I was pretty disappointed with the distribution.